During mothers day weekend I got on Zulily just to see what they had. That day happened to be pretty good for boys. Like most places, finding cute boy clothing is hit or miss. 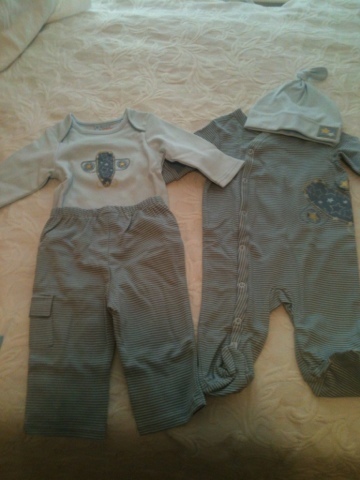 Unless you are talking about Baby Gap, then they ALWAYS have adorable things for baby boys. Well that day on Zulily I bought four outfits for Brady. I thought at that moment that this website was going to get me in trouble but I haven't bought anything since. Nothing has really caught my eye. I will say the only thing I don't love about Zulily is how long it takes to receive what you've ordered. Like I said, I ordered during mothers day weekend and just received everything in the last week. Oh well. 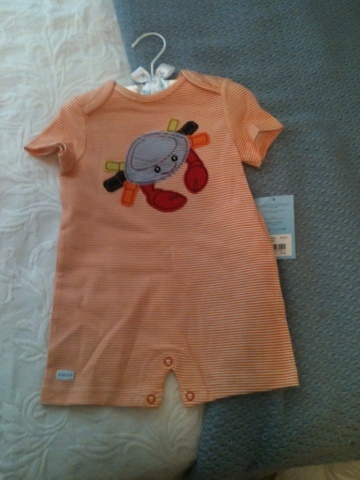 Here are some pics of my Zulily purchases. 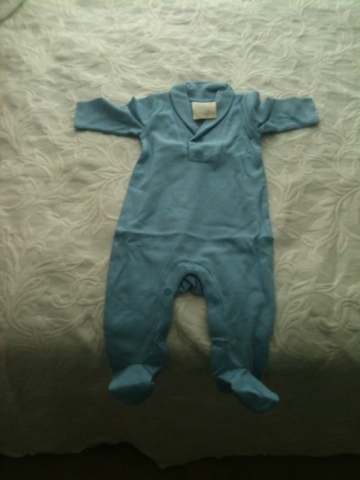 Brady is going to be on well dressed little man. 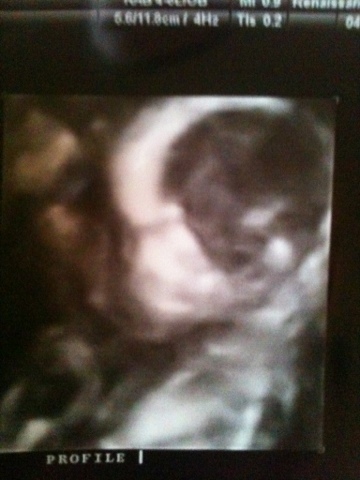 Six weeks ago, Manny and I went for a sonogram to find out if we were having a boy or a girl. We now know that we are having a sweet baby boy and are naming him Brady. At that same appointment, our doctor informed us that Brady's left kidney was slightly larger than his right. He told us not to worry about it and that it normally fixes itself. But when you are a worry wart like me and a doctor tells you something is going on with your baby, you are going to worry. Well we went to get a check up on Brady today and the kidney issue has in fact fixed itself. I have been praying and praying that would be the news we would hear! So glad our baby boy is strong and healthy!!! I am feeling so blessed today! Manny had to work today so I thought I'd take that time to do some crafts. 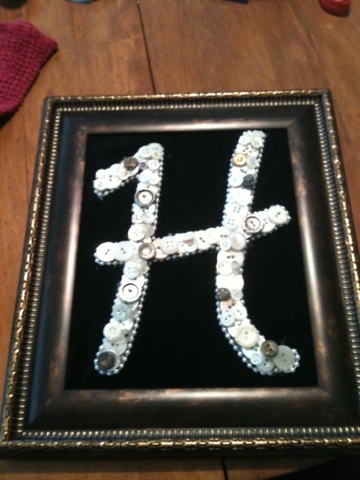 I was asked to make a monogram H out of buttons for a wedding gift so that was the first thing I made. 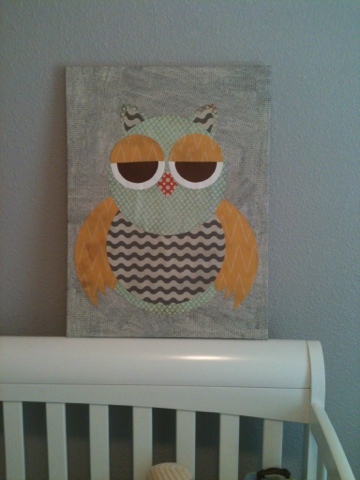 Then I decided to do a little craft for Brady's room. I got the idea off of pinterest. 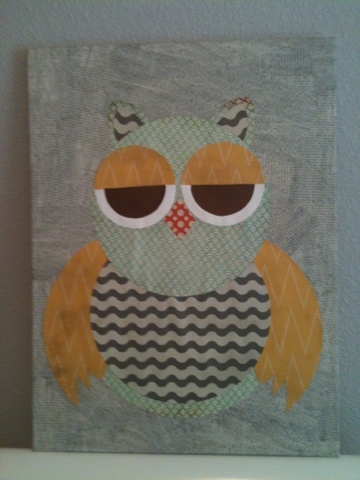 The pinterest version was a print but I decided to collage mine out of paper. I love the way it turned out. I can't wait to decorate his room! I'm having my first night of not being able to sleep. I went to bed fine but woke up around 2:30 this morning. Of course I had to make a trip to the little girls room. It seems I have to go all the time! But for some reason I wasn't able to fall back asleep. I laid there for a while, then played on my phone, then read a book, then laid there a little more. Finally around 4 I just gave up. 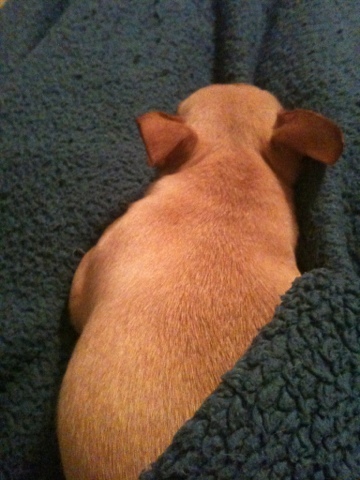 I wasn't about to wake Manny up, especially since he has to work today. But I felt fine. Brady was kicking a lot. I guess he decided it was time to get up. I like that he's already preparing me for the lack of sleep that is to come. I did have some other company other than Brady kicking me. Mija of course was by my side. She watches my every move. The minute I decided I was up so was she. I like that she will keep me company through insomnia. She seemed a little uneasy when we came into the living room to watch tv. She was up and down and not too sure what to do with herself at this hour. I wonder how many times she will get up with me once Brady is here before she decides she's over it and just stays asleep. A few weeks ago my mom and BethAnn were here. We went over to the Goodwill to see if they had any furniture that could be redone for Billie Rose. 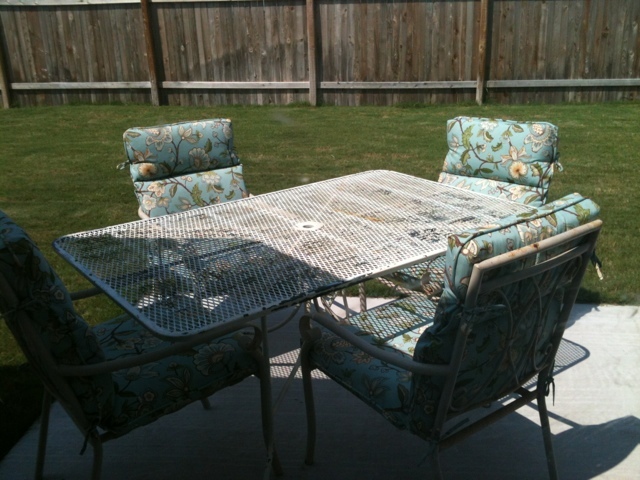 As we were walking out, they pulled out this outdoor patio set. 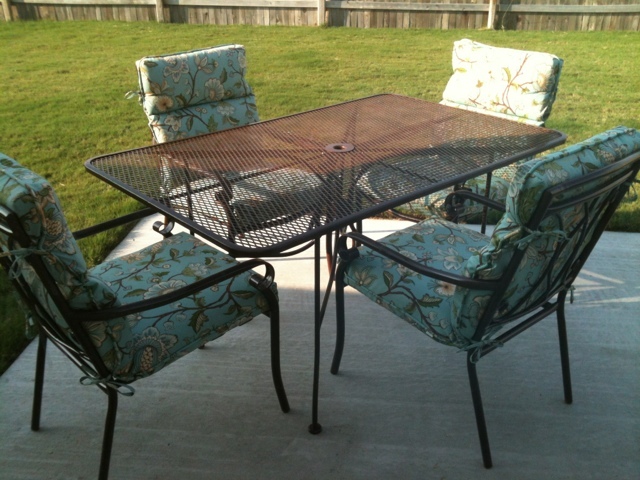 I was shocked only $30 for a table and 4 chairs!!! I bought it, duh! Manny went to work sanding it down and then spray painted it. It turned out so good!!!! Here are the before and after pics. Two weeks ago, my cousins hosted a gender reveal for Manny and I. We were so excited to finally find out if we were having a boy or a girl. Neither one of us cared either way. We just want a healthy baby! But I made Manny guess and play the "What Do You Think We Are Having Game." There's no way to know. All those tales about how you are carrying or the shape of your bump are ridiculous but, I thought it would be fun to play the game. I guessed a girl and Manny guessed a boy. Here are some of the pics from the day. My cousins decorated with pictures of Manny and I when we were babies.